We couldn’t think of a better way to mark Free Cakes for Kids Hackney reaching our 100 cake milestone than for it to coincide with our first ever bake for triplets. Odulcan, Kardelen and Omurcan Savaram-Gokmen turned six at the end of May and celebrated their big day with our 99th, 100th, and 101st cakes. As ever our bakers stepped up to the mark. 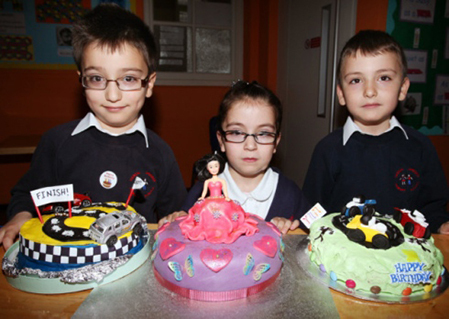 Becca Ljundberg, Anna Brewster and Alison Horner took on a cake each producing creations sporting racing cars and a princess, presenting the cakes to the triplets in person at their school. Such a big occasion deserved a bit of attention and even the Hackney Gazette came along to report on the event [link]. Fame and glory at the age of six… plus enough cake to share with their classmates and their family back at home. A top birthday we’d say and their mum agreed, telling us what a difference we’d made to their day. Free Cakes for Kids Hackney goes from strength to strength. Here’s to another 100 cakes and maybe even some more triplets’ birthdays. « Now That’s What We Call a Cake Sale!